Bleachers shake from stomping feet. Gleeful shouts of painted fans overpower the squeaking of shoes on the glossy court. Shrill whistles and screaming buzzers join the symphony of enthusiasm in a delightfully packed gym. This is another Helix-Grossmont rivalry game. The Foothillers hosted the Highlanders on February 2, 2018 for their second face-off this basketball season. Helix (5-1) won, 60-52, making them 2-0 against Grossmont (3-3) this year. A rivalry almost as old as high school sports are in San Diego, Helix and Grossmont embody the spirit of community and competition, with both sides of the gym filled to the brim with families and friends, who showed up resplendent with painted faces, team colors and school pride. Helix head coach Brennan Cassady said rivalry games are a highlight of the season. The game was one worth watching. 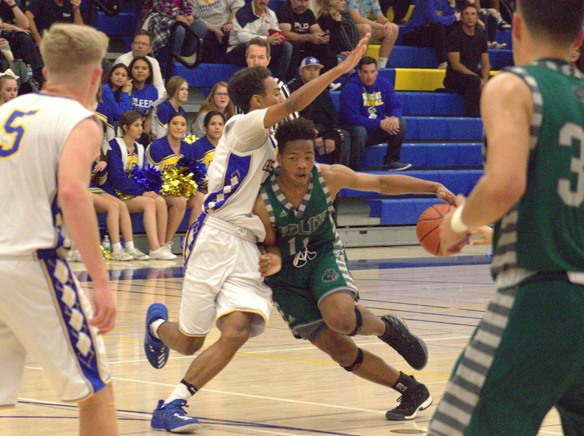 A close match-up, Grossmont had something to prove after dropping to Helix 60-48 on January 8. This time, the made sure the gap was smaller. Given the high stakes and the energy of the environment, the game heated up immensely on the court, with the last 90 seconds dragging out for nearly ten minutes from timeouts and free throws. The contentiousness on the court was palpable, but Green said the competition only lasts until the buzzer. Grossmont’s Austin Odom said their rivalry game against Helix is always highly anticipated. Odom said he would not mind seeing them in playoffs for a rematch. With just a few games left in conference season, playoffs are looming large on the horizon. Cassady said the real test of the season will be their second match against Steele Canyon, who they lost to in the first round. Though there is work left to be done in the season, Green said he is grateful for their games against Grossmont.